Ride-hailing service enables passengers to hail a vehicle using online platforms such as Grab, Lyft, Uber, and Ola. It serves as one of the most comfortable means of transportation, as it provides door-to-door services. Moreover, while hailing a ride, information of the passenger and the driver is exchanged, making this service safer than traditional taxi services. 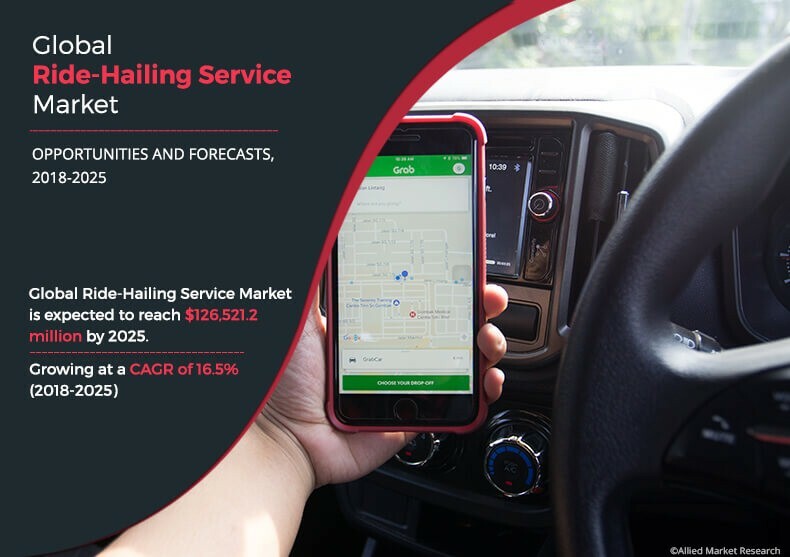 The growth of the global ride-hailing service market is driven by rise in trend of on-demand transportation services, creation of employment opportunities, and low rate of car ownership among millennials. In addition, advancements in connected & automatic vehicles to reduce CO2 emission and substantial increase in sales of these vehicles for the use of ride-hailing services propel the global market growth. However, low rate of internet penetration in developing regions considerably hampers the growth of the market. Moreover, enforcement of stringent government policies toward ride-hailing service restrains the market growth. For instance, the Bombay High Court recently took action against ride-hailing service providers such as Uber and Ola in Kolkata, Bhopal, and Mumbai, due to unnecessary hike in their service pricing. On the contrary, rise in trend of mobility-as-a-service and increase in user base of ride sharing services across the globe are expected to create lucrative opportunities for the market players. The key players operating in the global ride-hailing service market include Uber Technologies Inc., Lyft, Inc., Daimler AG., Grab, ANI Technologies Pvt. Ltd., Didi Chuxing Technology Co., nuTonomy, Denso Corporation, TomTom NV, and Gett, Inc. The global ride-hailing service market is segmented based on service type, vehicle type, location, end user, and region. E-hailing, car rental, car sharing, and station-based mobility are studied under the service type segment. On the basis of vehicle type, the market is categorized into two-wheeler, three-wheeler, four-wheeler, and others. Depending on location type, it is bifurcated into urban and rural. According to end user, it is segregated into institutional and personal. Region wise, it is analyzed across North America, Europe, Asia-Pacific, and LAMEA. The key factors that drive the growth of the global ride-hailing service industry are rise in trend of on-demand transportation services, creation of employment opportunities, and lower rate of car ownership among millennials. However, low rate of internet penetration in developing regions and stringent government policies for ride-hailing service are some of the major restraining factors of this market. On the contrary, the market is expected to witness significant growth in the near future, owing to increase in trend of mobility-as-a-service and upsurge in users for ride sharing across the globe. Each of these factors is anticipated to have a definite impact on the global ride-hailing service market during the forecast period. On-demand service comprise taxis, passenger vehicles, and charter vehicles, which provide real-time feedback, tracking of vehicle, and rating for service experience provision to end customers. Ride-hailing services ensure that customers can accurately locate the vehicles and track their journey alongside offer safety to the occupants, which in turn is expected to significantly drive the market growth. Abundant availability of cars and comparison of fare with correspondents facilitated by many mobile applications further drive the growth of the market. For instance, in August 2017, the launch of Migo, a Seattle-based search engine for on-demand ride services mobile application, enabled users to compare the locations and prices of nearby taxis and car-sharing & ride-hailing companies at a single platform. Ride-hailing service allows driver to work full or part time. According to the U.S. Bureau of Labor Statistics, the enrollment of full-time drivers is 40% more as compared to part-time drivers. For instance, in September 2017, CEO of Uber agreed that the company is creating more than 50,000 new jobs for drivers around the world every month. Expansion of ride-hailing services across the globe by various companies such as Lyft, Uber, OLA, Careem Taxify, and others and huge investment of Daimler, Volkswagen, and Denso in the ride-hailing industry are anticipated to create remunerative employment opportunities globally. Ride-hailing services require three parties for their operation that include driver, riders, and service providers. All the processes such as matching rider with drivers, fare estimation & calculation, ride payment, and reputation management are done by using smartphone with internet connectivity. Some countries such as Eritrea, Burundi, Chad, Somalia, and others have lower penetration of internet, which acts as a restraint of the ride-hailing service market. To hail a ride, the driver must have GPS-equipped smartphone that has active internet connection to identify exact pickup and drop locations of customers. Therefore, lower penetration of internet hampers the expansion of the market globally. People who are not capable of purchasing car can experience seamless travel through mobility services. According to the Bureau of Transportation Statistics, the average cost to own and operate a vehicle is around $8,858, assuming 15k miles traveled per year. Mobility-as-a-service decreases such costs for the user by providing improved utilization of transport services such as car sharing and ride hails. In addition, it reduces city congestion and overall vehicle emissions. Therefore, digitally enabled car sharing and ride-hailing manage travel needs in the smartest way, and provide a hassle-free and environmentally sound alternative to private car ownership. This sharing & ride-hailing activity that includes the entire process from travel planning to payments can be managed through a single mobile application, which is expected to create lucrative opportunity for the market in the near future. This study comprises an analytical depiction of the global ride-hailing service market analysis along with current trends and future estimations to depict the imminent investment pockets. The report includes the market share of key vendors and ride-hailing service market trends. 9.1. DIDI CHUXING TECHNOLOGY CO., LTD.
Ride-hailing service is a comfortable means of transportation, which offers door-to-door conveyance. The market for such ride-hailing services holds high potential in the transportation industry. The current business scenario has witnessed high demand for these services, especially in the developing regions, namely U.S., China, Germany, and others. 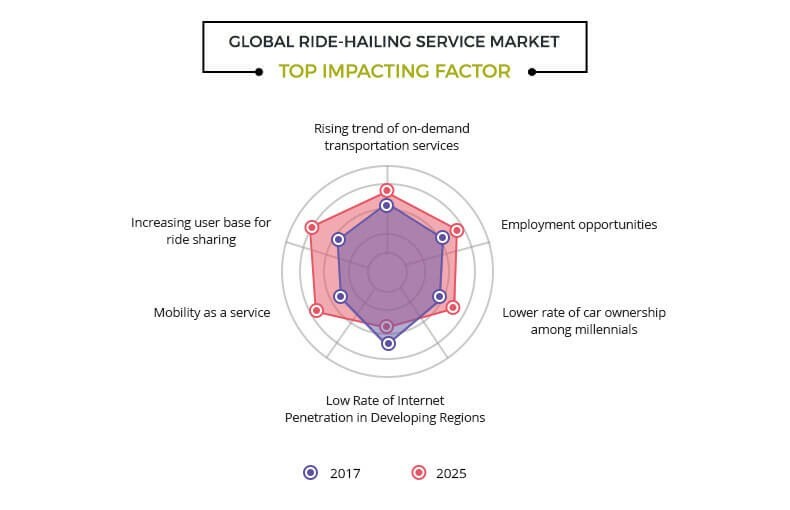 Rise in trend of on-demand transportation services, creation of employment opportunities, and low rate of car ownership among millennials are the key factors that propel the growth of the global ride-hailing service market. In addition, advancements in connected & automatic vehicles to reduce CO2 emission and burgeoning increase in the sales of these vehicles for use in ride-hailing services propel the global market growth. 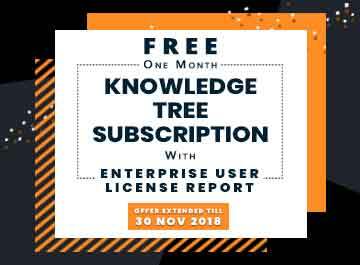 Moreover, the key players operating in the industry have adopted various techniques to provide customers with advanced and innovative product offerings, thereby fueling the growth of the market. However, low rate of internet penetration in developing regions and implementation of stringent government policies toward unprecedented hike in service pricing are some of the major restraining factors of this market. On the contrary, rise in the trend of mobility-as-a-service and increase in users of ride sharing across the globe are projected to create remunerative opportunities for market expansion. North America exhibits the highest adoption of ride-hailing services. On the other hand, Asia-Pacific is expected to grow at a faster pace in the near future. The key players operating in the ride-hailing service market include Uber Technologies Inc., Lyft, Inc., Daimler AG., Grab, ANI Technologies Pvt. Ltd., Didi Chuxing Technology Co., nuTonomy, Denso Corporation, TomTom NV, and Gett, Inc.